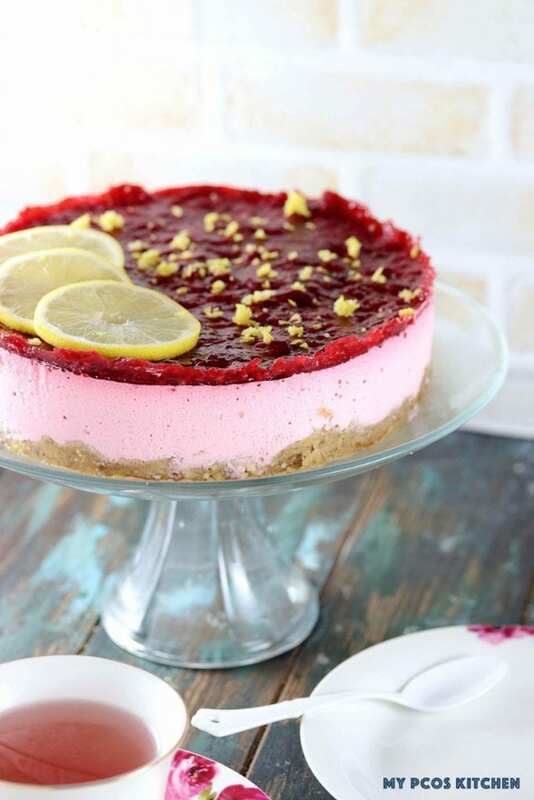 This delicious No Bake Raspberry Cheesecake is flavoured with fresh raspberries and lemon juice with some raspberry jelly over. I’ve been in a baking mood all week and making so many treats that I have to bring them to work this week. Today’s recipe is one I made last week and enjoyed every day since! I decided to make a No Bake Raspberry Cheesecake because I had some raspberries and lots of cream cheese on hand. Adding a little bit of the raspberry jelly over the cheesecake was actually one of my favourite part! I absolutely love raspberries so having that intense flavour over the cheesecake was wonderful. I love making low carb no bake cheesecakes because that way I don’t have to wait until the next day to take a bite! I can’t decide whether I prefer no bake cheesecakes or baked ones. A very similar recipe to this one that I’ve made on the blog were my Mini No Bake Cheesecake with Raspberries that were made in small muffin cups so they were individual portions. That one had a vanilla filling with some raspberry jelly over. I originally hadn’t planned on adding some lemon in there, but when I tasted the cheesecake batter, I felt that it would taste even better with a bit of tang. I added the juice of one lemon and its entire zest. Adding some lemon juice reminded me of my Avocado Cheesecake with Lime that I uploaded this summer. For some reason, I just really love citrus in cheesecake and especially the no bake ones!! But I may have to make a lemon baked cheesecake some time soon because I bet that would taste just AS amazing! I think that if I took my Keto New York Cheesecake recipe and added lemon juice and lemon zest, I’d be in heaven!! As for the crust, my boyfriend absolutely loved it! He asked me if I could make him just the pie crust next time as like a fat bomb or something and I have to say that’s a pretty good idea! You’ll understand once you take a bite out of it! I usually just do almond and butter in my pie crusts, but this time I decided to add some pistachios and walnuts for a bit of crunch. It was absolutely delicious! I sweetened this entire low carb no bake cheesecake with stevia powder, as usual, but you could also sweeten it with monk fruit powder if you wished! No Bake Cheesecakes are one of the easiest cheesecakes you’ll ever make. Since you don’t need to bake them, they take a little bit less time to make. There are many ways to make no bake cheesecakes. The most common way is to usually add some gelatin to cream cheese. I personally prefer mixing cream cheese and heavy whipping cream together rather than just cream cheese so that it can become even more fluffy. In Japan, the no bake cheesecakes are usually made with a combination of cream cheese, yogurt and a little bit of heavy cream. The first time I made a no bake cheesecake, I made the mistake of melting the gelatin and waiting until it cooled down before adding it to the cream cheese batter. Do NOT do this! I hadn’t melted the set gelatin so there were millions of gelatin balls in my cheesecake batter! It still set and was still delicious, but it wasn’t very nice to the palette. 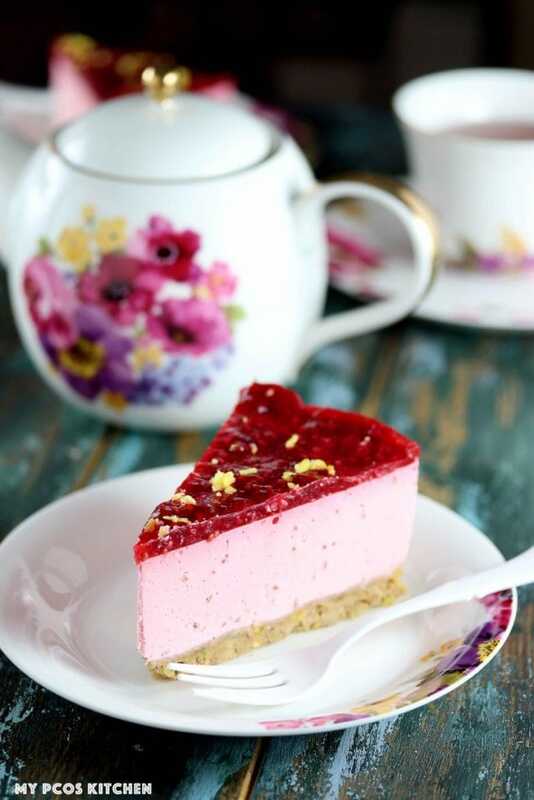 Once you add the gelatin powder to your boiling water, add it immediately to your cheesecake batter. You don’t want to make the same mistake I did! You can also add gelatin to cold water, wait 5 minutes until it sets and then melt it in the microwave or on the stove. The more gelatin you add, the harder your desserts will be. 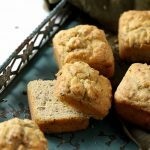 When I made this recipe for the first time, I had added about four tablespoons of gelatin to the batter. The cheesecake ended up a bit too tough to my taste, more like a hard jello than a soft cheesecake so I decreased the amount during my second try. 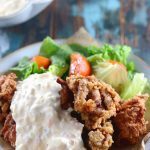 I try to avoid adding yogurt in my recipes just because of the carb count so I usually either stick with sour cream, more heavy cream, mascarpone, ricotta or yogurt from Jersey cows, who surprisingly have less carbs than regular Holstein cows! Now that you know how to make a no bake cheesecake, what flavour will you make yours? 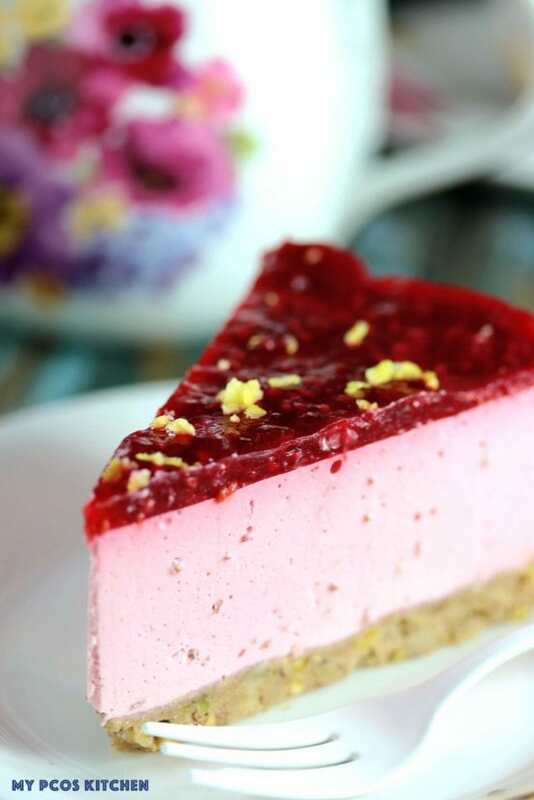 A delicious gluten-free and sugar-free no bake cheesecake! Add the crust ingredients into a food processor and blend for about 20 seconds. Take the dough with your hands and add it to a 9 inch springform pan. Press with your fingers and spread the dough all over to make a crust. In a small bowl, add the gelatin and boiling water. Mix until the gelatin has dissolved. Add the raspberries to a pot with the water. Bring to a boil and crush the raspberries with a fork. Add the gelatin to the raspberries and mix. Turn off the heat and set aside. In a large food processor, add the cream cheese and sour cream. Process until smooth. Add the lemon juice, stevia and heavy cream. Process for a minute and scrape the sides of the food processor if need be. 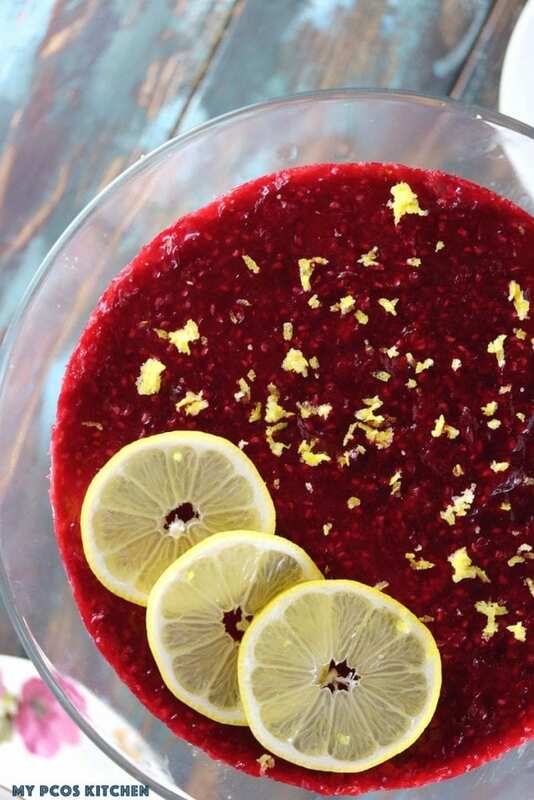 Add 1/2 of the crushed raspberries from the pot to the food processor and grate the skin of a whole lemon into it. Process for another minute until the entire mixture is completely pink. Pour the raspberry cheesecake batter over the pie crust and place in the fridge for an hour. Take it out of the fridge and pour the last half of the crushed raspberries over the cheesecake. Place the cheesecake back into the fridge for 3+ hours or until it's completely set. 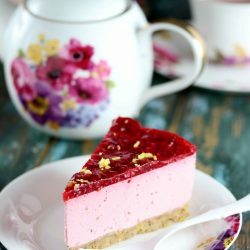 This cheesecake is so delicious! It does not taste low carb at all. I had no problems with the recipe. After 3 hours in the fridge it held its shape as perfectly as your photo. I used about 1/2 cup powdered Swerve instead of Stevia and that worked great. Cinnamon was a nice touch in the crust. 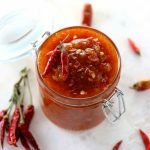 I dont have a food processor, can I put everything in a blender? Hi Amber, it might get stuck. I suggest using a hand mixer instead. I used a blender and it worked great! Can you use a different sweetener? I have both powdered Swerve and golden Monk fruit. Will either of these work? And if so at what measurements please? Hi Cathy, you can use any sweetener you want. Just taste test with your finger for the perfect sweeteness. I like the look of this and will have a go. or that the total of 2 packs should be 450g? 1 pack of cream cheese is 220g, so 2 packs is 450g/16 oz. Do you not bake the crust? Just put in pan and pour filling on top or bake and cool? Yep, no need to bake it! Of course! Any fruit will work. This did not turn out well, and I cook a lot. The cinnamon was over powering and not good in the crust. The US conversion called for 2 TBS of gelatin, but two envelopes should have been used instead, the consistency was way off. I have made several of your recipes and always been pleased, but this one will not be made again. It may have just been the conversions, but it ruined our Valentine’s dessert…so…..
I’m sorry you didn’t like the recipe, but I measure all of my recipes in weight which is why I said 15g of gelatin which is 0.5oz, which also equals to 2 envelopes of gelatin. It was about 2 tbsp when I measured it. If you click US imperial for the measurements, it says 0.53oz which is 2 envelopes. The cinnamon is my favourite part, sorry you didn’t like it. Ok, I made this four times already and am not a cook. It is just so easy I never failed at it! Can you use Pyure for the sweetener? I want to make this for my husband’s birthday since I’ve never made a cheesecake before. What type of pan do you use for the cheesecake? Hi Maureen, it depends what kind of pyure you’re talking about. If it’s the packets, yes. Just add as many as you want, and taste test with your finger. I wouldn’t recommend the blend one because then the cheesecake will be kind of grainy since the sugar(erythritol) isn’t melting/cooking in an oven. I used a 9 inch springform pan where you can lift off the bottom. I have made this twice now, once with raspberries and once with strawberries. It is my new favourite dessert!! Thank you so much for sharing such a delicious recipe!! 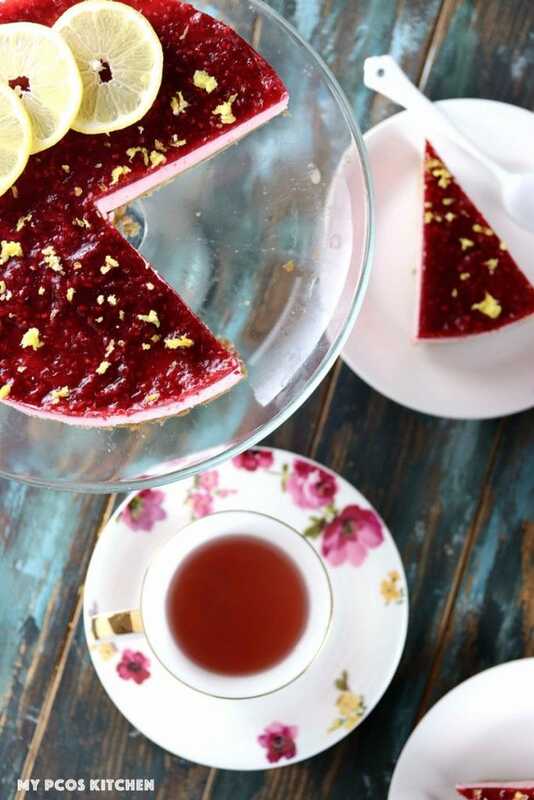 Lemon and raspberry are such a classic flavour combo. Love the NO BAKE dessert, especially this time of year. This would be a great party dessert. I loved it alot !! Such a show stopper of a centerpiece and how perfectly tidy you cut that slice! I am amazed by how neat and perfect that slice looks! Sounds like a delicious cheesecake too. I love that you don’t have to bake this!!! Saves up so much room in the oven during the holidays!